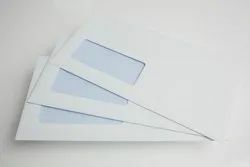 The width of these envelopes is kept ideal to make sure that important document can be inserted easily. Our offered document envelopes are made from high quality bio degradable material. We can do the printing on it. Our Criss Cross Waterproof Paper envelopes have two layers of kraft paper that are laminated with bitumen.we offer reinforced with a series of thread line in a criss cross manner to make it strong. We have specialized our envelopes in criss cross reinforcement techniques in bituminized paper. We offer customised envelopes as per customers requirement. We are manufacturer and supplier of Document Pouches that are manufactured using supreme quality raw material purchase from trusted vendors. We can print or emboss your logo and name of your company on the pouch. We are wholesale Supplier, Manufacturer and Distributor in Chennai., Tamil Nadu. Keeping the diverse requirements of customers in mind, we are instrumental in providing Document Envelope.